This section talks about the abstract sympbols of Yin-Yang and Bagua. This section talks about the Yin-Yang and Bagua. These are abstract symbols created to visually represent the evolution of the world and human life, and to help guide the path of Daoist cultivation. The construction of this system began with the legendary emperor Fuxi, who lived during prehistoric times. Fuxi constructed the Innate Bagua (先天八卦) which used Yin(- -) and Yang(—) lines to describe the eight phenomena of the world: Sky, Earth, Sun, Moon, Wind, Thunder, Mountain, River. These eight phenomena are represented by eight trigrams of Yin and Yang lines. Then, during the Zhou Dynasty (12th century B.C. ), Zhou Wen Wang (周文王) evolved the Innate Bagua into the Acquired Bagua (后天八卦), arranging the same eight trigrams in different positions. Furthermore, out of the eight trigrams he constructed the 64 trigrams to provide further descriptions of different worldly phenomena. 600 years later, during the Autumn – Spring period (6th century B.C. 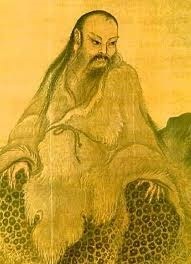 ), Laozi described the changeless reality behind the changing phenomena. This changeless reality is the context out of which the dualistic nothingness (无) and existence (有) arose. Also during the Spring-Autumn period The Yin Yang school, one of the main intellectual schools during the time of Confucius and Laozi, theorized and formalized the structure of Yin Yang Bagua, including their relationship with each other and to the world. – Eight Trigrams divide into 64 Trigrams. On top is Fuxi’s Innate Bagua, below is ZhouWenWang’s Acquired Bagua. In both diagrams, Yin-Yang represent the core elements in the centre, with white represents Yang and black represents Yin. Despite of being opposite, Yin and Yang are rotating into each other, and within Yang is a spot of Yin and vice versa, illustrating the ever-changing nature of the phenomenal world. If we further divide Yin-Yang in the center, we get Four Phenomena/Direction and then we get Eight Trigrams in the peripheral, which represents the different phenomena observable in the world. If we return inward to the center, from eight trigrams to four directions to Yin-Yang and transcend them, we arrive at Taiji/Dao, which represents the transcendence of all opposites/duality, the ultimate state in Daoist cultivation as described by Laozi in his book DaoDeJing.